It might seem a little repetitive, us preaching about email automation over and over again, but it’s because we honestly believe in the power of automation to help meet business goals. Which business goals? Well, any and all of them. 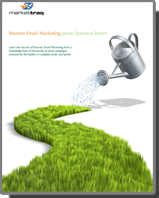 Don’t believe us, a recent case study from MarketingSherpa discussed how B2B marketers used email automation to bolster their existing customer service program. This campaign helped increase customer retention, and the team thinks they will see the goodwill generated through this marketing automation cascade into more repeat customers and a significantly lower cost-per-acquisition in the future. Still, for all of Marketing and Email Automation’s success, it’s important to note that you have to do it right in order to get strong results. So with that in mind, let’s take a look at the campaign executed by Workopolis in the case study, and see what we can learn from what they did right, as well as think of ways we could improve the process. As the case study write-up mentions, the most important thing you need to do to make sure your marketing automation efforts succeed is to make sure that everyone and everything is on the same page. This means identifying all the information you will need to meet your goals, making sure that the information exists, and making sure that it is easily accessible. One of the biggest issues we routinely see with companies setting up marketing automation efforts is that the data needed to truly make the system intelligent is either closely guarded in a proprietary system that doesn’t/can’t communicate with the marketing software, or simply doesn’t exist. The other major point is that everybody across all involved teams needs to know what is going on and what the plan is. All too often, departments within companies that need to work together to pull of an ambitious campaign are not used to working together, and communicate only rarely through hurried emails, and even then only when something is required immediately. In order for a truly effective marketing automation campaign to work, all of your teams need to know exactly what is going on, when it’s going on, and what their role is. Get your teams ready by encouraging cross-department meetings during the planning and conceptualization stage. It will make the realities and challenges of the project more apparent earlier, and help your campaign go off without a hitch. After you make sure that you have the capability to coalesce your team and data-sources around a single project, it’s time to start conceptualizing and planning. The biggest question you need to ask yourself before starting any kind of marketing automation program is: How will this help my customers? Far too many companies begin this process the wrong way around; by picking a business goal and then shoehorning a customer-side solution to it whether your customers want/need it or not. Remember: like any email campaign, an automated email campaign needs to be relevant, timely, and expected. In fact, this rule goes double for automated campaigns, since you do not always have a set of eyes going over each email before it’s sent. Once you have an idea of what your customers really want from you and what you can give them that’s of high value, it’s time to revisit step 1 and see whether you have the technology in place to help your customers in the way that you want to. This is where the importance of having cross-team meetings and communication is vital: the best, loftiest ideas will not succeed unless you have the tools available to really help your customers. One of the critical aspects of the campaign launched by Workopolis is the willingness to perform cross-channel follow-up. 15 days after purchase, a member of the customer support team would call customers to follow up on their purchase, and see if they could help improve job posting performance in any way. Too many marketers, especially in the email field, can’t seem to find the balance between too much and not enough cross-channel involvement. Granted, we haven’t heard what those phone calls sounded like, but it sounds like Workopolis managed to hit the nail on the head. The phone call is centered around helping customers achieve the stated goals of the campaign, and not simply a call to upsell them to the next price point. This kind of “in the customers’ best interest” cross-channel follow up has a history of being very successful, and it’s a shame that more marketers can’t find the line between being overly-aggressive in phone and other media when following up and not following up at all. Email can be a great channel, and automating email is an incredible way to seriously boost ROI and bottom-line figures, but marketers need to remember that it comes with a price. You need to be more thorough and more detail-oriented when setting up any automation plan, not just email, lest you run into problems that you don’t catch until way down the line. There’s an old adage that says “Measure twice, cut once.” With any kind of automation, from email to saw-mill, the adage should be “Measure three times, cut once.” Good luck, and happy emailing.